Hi, I am interested in your 1963 Ford Falcon (stock #4622-CHA) listed on Autotrader for $24,995. I'd like to get more information about this vehicle and confirm its availability. A red convertible with bucket seats, four-on-the-floor, and a V8 under the hood is exactly what we all love. So take a look at this 1963 Ford Falcon Futura, because it gets it right, and it does it right from the start. This is a Falcon for those who like a hint of aggressive nature. Mag wheels, classic Firestone Wide Oval tires, and wide dual exhaust tips are all great sports car pieces, but this convertible goes further. It was upgraded to red paint later in life to give it a very sleek personality. Plus, everything from the hint of a hood scoop to the spear-like full-length side trim are great touches of sportiness. So this really does have that kind of appearance youll love to just take on the open road. And wherever you arrive, this one even has a story to tell. 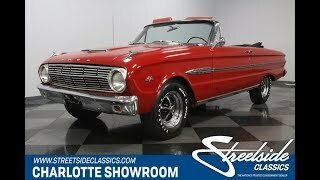 This Falcon was originally ordered for Fords #22 Charlotte sales region, which means it likely spent most of its 55 years right near our showroom! While the black folding roof looks great against the exterior, the red interior with the red exterior is what youll really love. It has a slightly deeper tone inside to give this drop top a European-like impression. Bucket seats and a floor shifter are exactly what you want in a drivers classic. Speaking of classic, the bright trim on the center console, flowing across the dash, embedded in the seats, and so much more gives this a terrific vintage appeal. But youll also notice some fun upgrades like the wood-like appearance of the steering wheel (it goes well with the classic Aoogah horn) and the AM/FM/cassette stereo w/digital tuner that provides better driving tunes. The motor is the same 260 cubic-inch V8 that found a home in the early Mustangs. This power plant is presented nicely in the engine bay with the bright air topper and the famous Ford blue on the valve covers and engine block. You also see the signs of good care with well-maintained belts, hoses, and wiring. Even the correct FoMoCo washer fluid bag is in place! With this kind of tidy presentation, it should be no surprise that the motor fires right up, and it even gives a hint of the classic V8 rumble thanks to the dual exhaust. Out on the road, the control of the four-speed manual transmission and the Falcons lightweight nature combine to make terrific classic convertible driving experience. Bright, complete, and truly interesting this is the droptop classic thats both a driver and has a story to tell. So dont let this Falcon get away, call today!